There are many myths about 4G. Some are true and others are false. This article attempts to clear up some of the confusion. Reality: That depends on your definition of 4G. Most experts say iPhone is still a 3G phone — even though a 4G icon appears when you’re connected to the AT&T’s HSPA+ network. 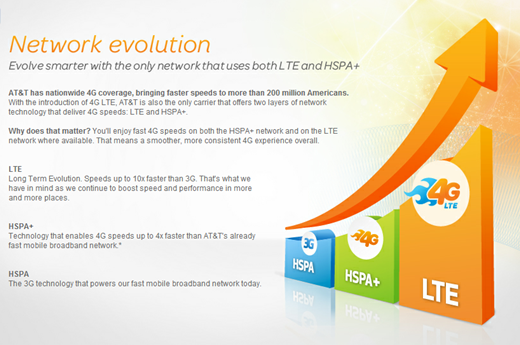 HSPA+ speeds are faster than 3G, but not near as fast as those found on a good 4G LTE network. One thing is sure: The iPhone 4S does not yet support 4G LTE. Reality: Studies show that AT&T’s data speeds vary wildly depending on the time of day. Sometimes they’re good, but often they’re mediocre. Download speeds are especially problematic when the network gets more congested in the afternoon. 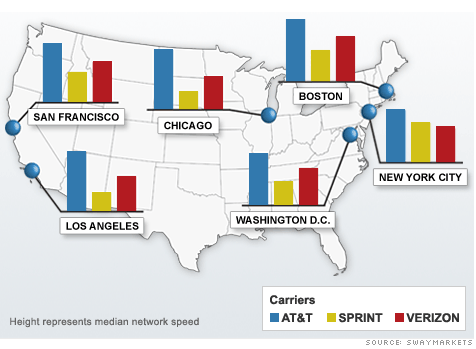 Reality: LTE users sometimes report speeds that are 30 times faster than average 3G speeds. I ran more than fifty Speed Test runs and saw average download speed of 17Mbps, and an average upload speed of 9Mbps. My peak speeds are 45Mbps down and 28Mbps up. Pretty amazing. Reality: Most 4G data plans cost exactly the same as 3G data plans. Most Verizon customers pay $30 a month for 4GB of data. 4G phones don’t cost any more than 3G-only phones. You can buy a great phone that supports LTE for as little as $49. Reality: 4G LTE launched back in 2009, and has been available in the U.S. since December of 2010. More than fifty different mobile devices now support LTE. Learn more about the history of 4G LTE here. 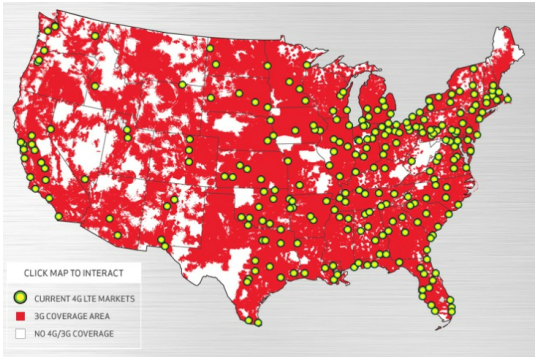 Reality: Verizon has LTE support in more than 250 cities, while AT&T is in less than 40 cities. Sprint and T-Mobile do not currently offer 4G LTE service. See the coverage map above for more details. To access the newest coverage maps, download Sensorly or the Cell Phone Coverage Map app by Root Metrics in Google Play or the App Store. Reality: Even if your carrier has 4G coverage in your city, don't expect to get LTE everywhere you go. I only see 4G light up about 30% of the time. Myth 8: HSPA+ results in higher speeds when LTE is not available. Reality: This depends. In theory having HSPA+ to fall back should result in higher speeds, but according to experts, network congestion makes the drop-off from LTE on AT&T’s network to be just about as steep as Verizon’s. Reality: In most cases this is untrue. Sure you’ll be able to download data much more quickly, but unless you stream a lot of HD movies, you’re going to have a hard time exceeding the 4GB data limit that carriers like Verizon are currently offering. 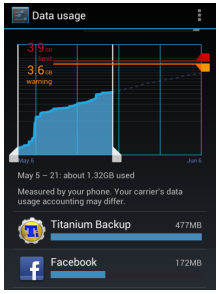 Even if you do crazy things like backing up your entire phone to Drop Box with Titanium Backup, it’s hard to go over your limit. Reality: This is true. 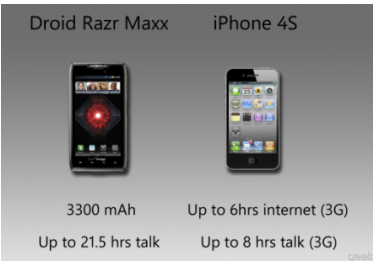 That's why 4G phones like the Droid Razr MAXX include much more powerful batteries. If your 4G phone does not have an extended life battery, upgrade it, buy a second battery, or turn off 4G when you’re in an area without 4G coverage. Reality: This is true. Several carriers outside of the U.S. are preparing to launch VoLTE, which along with HD voice codecs, can have dramatic difference on the quality of your voice calls. Verizon is rumored to be launching a voice over LTE service early in 2013. Reality: In most cases this is true. HSPA+ is capable of real world download speeds of 4Mbps and higher. Some have even seen HSPA+ speeds as high as 16Mbps when stationary, but these drop way down when you are walking or in a moving car. More info. Reality: Not true. Carriers plan to increase their data rates beyond current LTE limits by using two 20 MHz channels and/or MIMO antenna arrays. Sprint says this will allow their network to reach speeds of up to 168Mbps. As long as you own a device which supports LTE, you’ll enjoy getting data speeds on your phone which are faster than those that you get over home DSL. A really well written piece. I always enjoy the bottom line on such matters. So now I know.